My hands have been well and truly pampered, the colder weather is seriously taking it's toll on them. Luckily for them I am equipped with all kinds of lotions and potions. I have been using the balance Me Super Moisturising Hand Cream* for a little while now and love having a tube of this in my bag but also another by my bedside. It smells divine and doesn't leave hands feeling greasy, the mix of essential oils makes the hand cream feel very luxurious. The formulation is very soothing and hydrating, so if you suffer from sore dry hands this would be a great hand cream to try. The next product is a balm and best used at night time, the Badger Balm For Hardworking Hands* is a thick balm which you need to scoop out and melt in your hands. It can feel a little greasy at first depending on how dry your hands are. It's great for soothing chapped red hands, I would say this would be the last thing you do before heading to the pillow! The scent is very subtle, it reminds me of the antiseptic cream Germolene. It's a nice soothing scent and not off putting at all, a great product to carry around with you thanks to the packaging. For days when I want to paint my nails I've been reaching for Malava, they have a great selection of polishes. I use their Double-Protective Base*, it dries very quickly and prolongs any the life of the coloured nail polish. After I've applied the colour I then reach for Colorfix*, this seriously makes the coloured polish look so glossy. It's a great top coat and paired with the 002 Protective base they make a great pair for helping your manicure last longer. If I'm pushed for time I use the Mavadry*, this helps nails dry in seconds and again gives a healthy glossy finish to the nails. You can also apply another layer of this a few days later to brighten up your manicure. I highly recommend this tough trio. 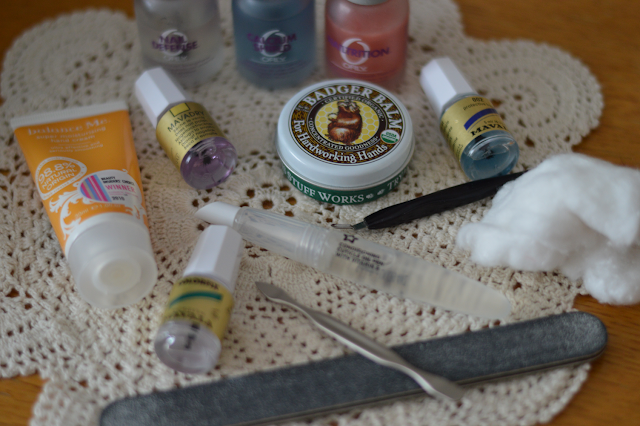 My latest discovery is the Superdrugs own Conditioning Cuticle Oil Pen with Vitamin E. I found out about this little gem after reading The Sunday Girl blog. As soon as I read Vogue was singing its praises and it cost a purse friendly sum of £2.99 then I knew I had to invest...soon! I've had it just over a week and already my cuticles look healthier. I've not noticed my nails getting any stronger but it's only been a short time so I shall update you at a later date. 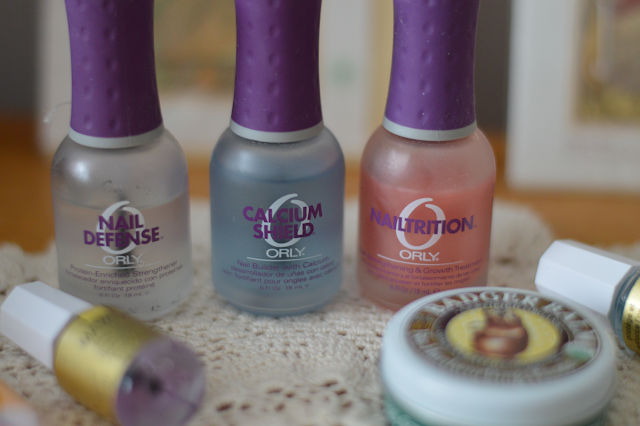 I've been using Orly for a couple years now and their treatment polishes are fab, they have a great selection to suit different problems. I've never had super strong nails, they often peel and get dry. Nailtrition* targets that problem by strengthening and stimulating nail growth faster. This is a great treatment to use if you're nails don't grow or if you've had acrylic nails on. It's a lovely subtle pink with a very slight shimmer in. You can wear this alone or use as a base coat under your polish. Calcium Shield delivers just that...Calcium. Just what nails need which don't grow or are in bad condition. Perfect for thin weak nails, Nail Defense* acts as a thick protective layer to prevent from any future damage. Can be used a lone as a base coat under your polish or if worn alone 2 coats can be applied. This is a weekly treatment. Nail Defense* is another great treatment to prevent nails from splitting or peeling, you apply a coat every other day. Can be used a base and top coat, it's rich protein and gelatin to help fortify nails and make them stronger. So with all these lotions and potions I am hoping for stronger nails this year so I can enjoy wearing some lovely spring/summery shades! I love Orly...it is the only base and top coat that makes my polish last with the life I lead! !